Allergies are caused when our body responds to something in our environment that doesn't agree with us (called an allergen). Babies can be exposed to allergens through touch, eating, drinking or an injection. The body responds by releasing histamines in an attempt to fight off the allergen. Histamines, however, can give your child coughing, sniffling, sneezing, and a runny nose. In more serious cases, a baby can experience what is called anaphylactic shock, which causes rashes, swelling and difficulty breathing; this condition can be life threatening and is considered a medical emergency. Some of the most common allergens (things that cause allergies) are dust mites, animal dander, pollen and mold. These allergens usually cause nasal allergies, such as sniffling, sneezing, coughing, and a runny nose. Other allergens can come from food, drugs, animals (dander), and bug bites. 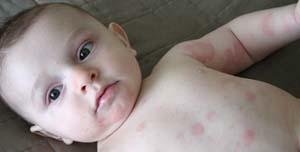 Click here to see more pictures of allergy rashes. What is the difference between allergies and a cold? How can I tell the difference? There are some common signs of allergies that can help you determine whether your baby has a cold or allergies. Some of the most common signs of nasal allergies are: symptoms lasting more than 7-10 days, constantly stuffy or runny nose, constant wiping of the nose, clear and thin snot (rather than green/thick), a lot of sneezing, itchy eyes (often watery and red too), dark rings under eyes, breathing through the mouth, itchy red rash. Either way, you should contact your doctor; but if your baby is exhibiting some of the above symptoms it is most likely that he or she is having an allergic reaction. How will I know if your baby is allergic to something? This is a tough question! It can take a long time for babies to show the symptoms of an allergy, and every baby has a different threshold of exposure before an allergen causes a reaction (sometimes lasting several months!). What that means is you may not necessarily know if your baby has an allergy when you first bring him or her home from the hospital. But it could be true that after extended exposure to the allergen, such as a cat or dog, the baby will start to show symptoms. It takes even longer for seasonal allergies to things like pollen, grass and mold to develop, sometimes not until your child reaches 3 or 4 years of age. How do I know what my baby is allergic to? Sometimes you will "luck out" (not really that lucky!) and figure out your baby's allergies from experience, such as realizing that your baby only shows symptoms of allergies when it is damp or rainy outside (mold), or only in spring, summer and fall (pollen). The best way to figure out what your baby is allergic to is to see your doctor. You might even get sent to an allergy specialist who can do a series of tests to determine what your baby responds to by doing blood tests or skin tests (applying a small amount of possible allergens to the skin and checking to see whether the baby has a reaction). In babies, skin tests tend to be more accurate than blood tests in determining allergies. The key to preventing allergies is to understand what the allergens are and where they come from. If your baby is allergic to your pet, the best bet is to give the pet away for adoption. Shaving your pet will not reduce the amount of allergens it produces. What you can do, however, is purchase shampoos that help keep the amount of pet dander down, and keep the pet in a different room than where your baby sleeps and spends most of him or her time. If your baby is allergic to dust mites, there are a lot of steps that you can take to minimize exposure. Buy a new mattress and pillows, or encase them in allergy-proof covers (like these). Wash your baby's sheets and blankets in hot water at least once a week. Dust furniture, shelves and ledges, and vacuum carpets and clean hardwood floors with natural cleaning products (do all of this while baby is out of the room). If possible, replace carpets with hardwood, vinyl or tile flooring. If your baby is allergic to mold, there are a few things you can do to help reduce mold in your home. Clean bathrooms thoroughly (such as with bleach and water) and keep down the humidity levels, for instance by running a fan after showers and baths or running a dehumidifier (like one from our best humidifier list). Always run a dehumidifier in your basement to reduce mold growth. Can I give medications to my baby to help with allergies? Yes, there are some over-the-counter and prescription medicines that can help your baby, but talk to your doctor first before giving your baby any of these medicines. Your doctor may want your baby to take antihistamines, and he or she may also offer you a prescription. Most allergy medications are not approved for babies younger than 6 months of age.